It was at a dinner with my esteemed OC Weekly colleagues when I realized I'd been going at it all wrong. The assumption I previously held was that I had to go to the Chinese food Mecca of San Gabriel Valley to get a proper Peking duck. 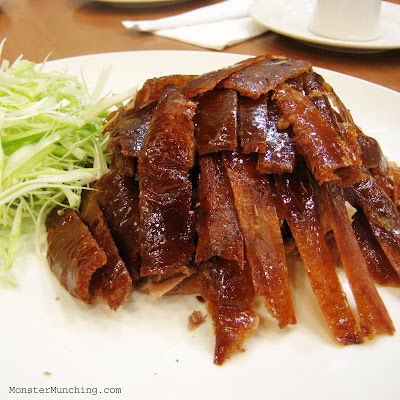 I did just this a few months ago, making the pilgrimage to the much lauded Duck House in Monterey Park where I ate the dish and concluded that duck skin is a tease. After it all, I said I'd rather have the skull-rattling crunch of roasted pork skin, thanks. "Compare them to a Chinese roasted pig, or Filipino lechon, and the water fowl skin seems like a lightweight. It's like O'Douls next to a pint of Guinness. A Lay's chip next to a Kettle Brand. William Baldwin next to Alec Baldwin. You get the idea." Then I had the duck from Tri-Village** in Irvine. And finally, I'd found what I'd been looking for, and to think it was here within arm's reach and a less than 10-minute drive all along. Since that evening and every evening I've had this duck, I've decided that this will be the bird I'll be putting up against all others. To my friends who live the San Gabriel Valley, I'll say, ours is better than yours. To look at the shaved skin in its crispy, caramel-colored shards, you could mistake them for sheets of spun sugar candy--shiny, translucent and ever so brittle. And to taste them is to conclude that duck skin IS candy. This was far and away better than anything I had previously. If you want to order this duck, you must plan ahead and call it in at least two hours in advance of your arrival. It will cost you somewhere around $30 for the bird, a few bucks more for the soup they'll make from the rest of the carcass. But what you receive is a ritual that respects the bird as more than just a meal. 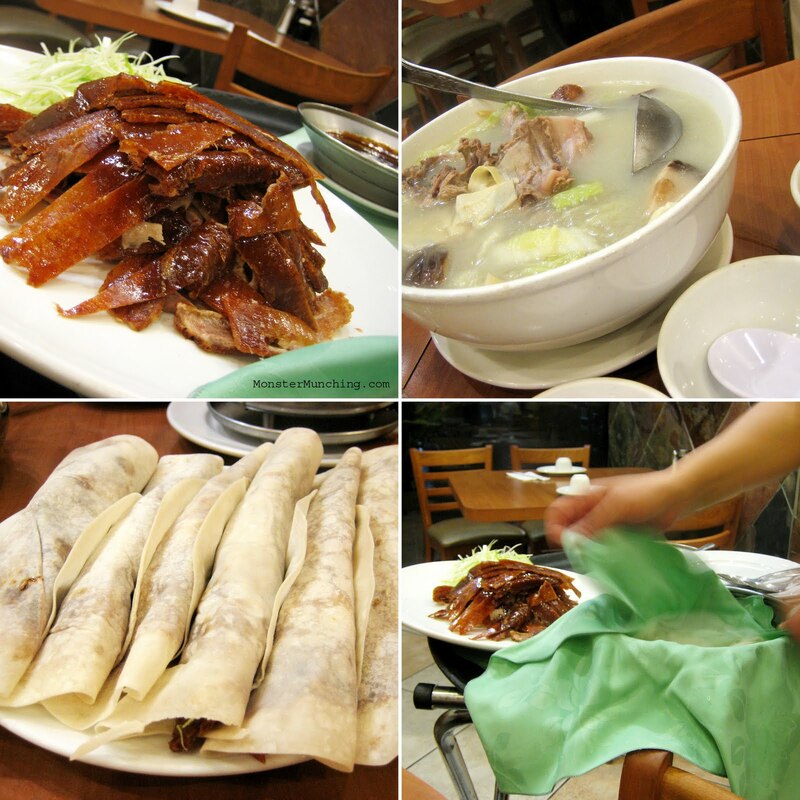 Eating Peking duck at Tri-Village feels like an event. Compare this to The Duck House in Monterey Park and it's almost like night and day. Since The Duck House is in the business of turning out duck after duck, you never see your bird before it's sliced up and turned into a plate of skin and meat. It could be any other dish, really. You are then charged with wrapping your own duck crepes. When Tri-Village brings out the duck you requested, whole and glistening, they'll allow you to inspect it before they do the carving. And the service doesn't end there. They will assemble your duck tacos for you table-side, taking round after round of the pliant crepe-like tortillas, painting them with a swipe of a special Hoisin-like sauce, placing some shaved curls of scallion, a few flecks of that flavorful and crunchy skin, scraps of meat, and finally rolling each one into lengthy cigars, one after another, each equally portioned so that every bite is as delectable as the last. After you eat one, and the one after that, you'll come to the same realization I made earlier. By the time the soup comes, you're sold. This murky, soul-soothing simmer of the meat-stripped bones is equal to the majesty of the dish that preceded it. Bowl after bowl, you'll slurp clear noodles and sip a broth that reaffirms the best things in life are those that simple and close by. **Note: Please read the update regarding the change in ownership in the comments section. 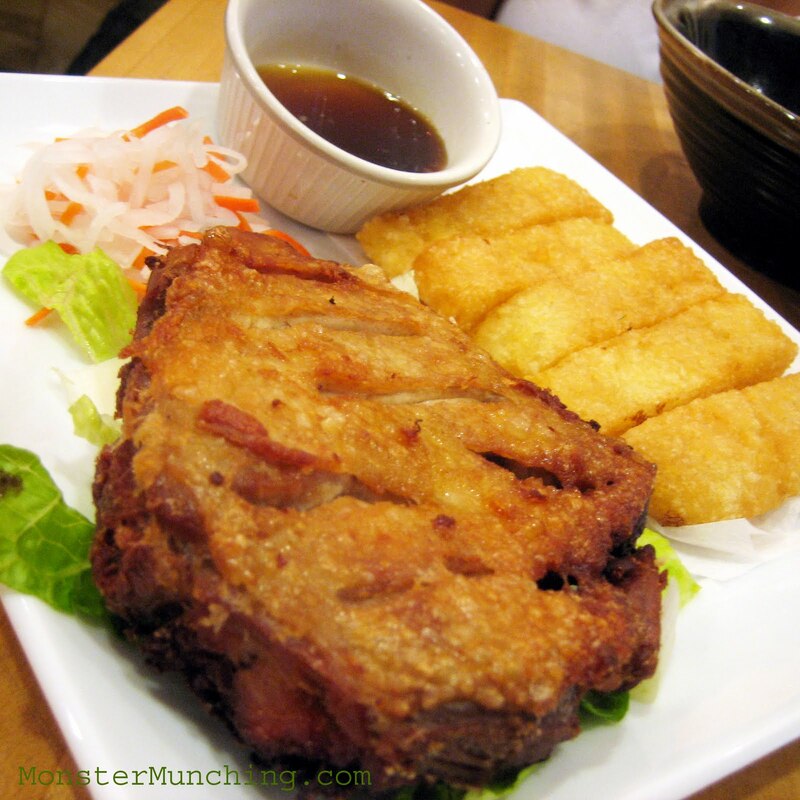 What is that golden-fried club, all crispy and glorious? Why it's a fried banana, of course, the donut of South East Asia (if you don't count the things they also do to fried dough). We took this one after our lunch at Quan Hy last week. 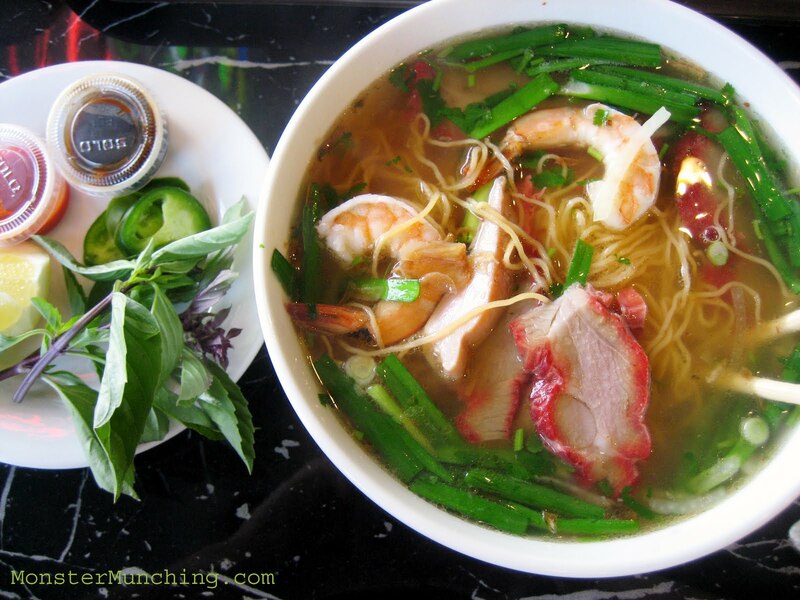 Thach Che Hien Khanh is located right across the plaza, donchaknow?! And it is the preeminent purveyor of all things sweet and dessert in Little Saigon. There are lines even when there shouldn't be, in the middle of the afternoon. People patiently queue up to order from steam trays filled with the sugary, the bean-based and the sticky-rice-anchored. What you order gets piled into take-out containers, sold and then consumed for later. But we came in with the express desire to have fried bananas. I pointed at the tray, where they were stacked out in the open. "Two! ", I said, holding up the appropriate amount of fingers for emphasis. Our cashier proceeded to pick up with tongs one, two, three, and four of the browned fat logs into a paper bag. She looked up, saw the puzzled look on my face and replied, "Oh I thought you meant two dollars' worth! Sorry!" When we got back in the car, we couldn't wait until we got home to eat them. Biting into one was like that first tap of a spoon on a creme brulee: there was just a slight resistance that quickly gave way to the blubbery custard beneath. On this fried banana, what seemed like a natural crust had formed on the batter--a sugary, caramel shield that made it still inexplicably crunchy even after sitting there out in the elements for probably at least an hour since its birth. It was delicious. One of the better and most unadulterated fried bananas I've eaten. Now I'm wishing the cashier left the other two banana fritters in there. 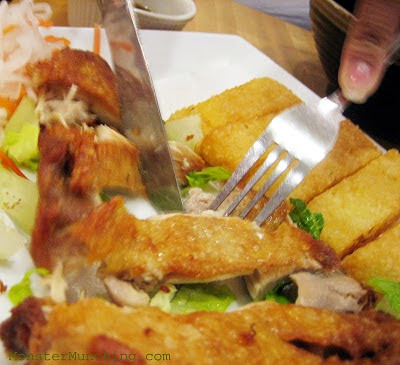 Xoi Ga is sticky rice with chicken, a Vietnamese street dish that, if I wanted to oversimplify, closely mirrors Hainan chicken--boiled or steamed hen presented in pieces over rice. And that's what I was expecting when a friend ordered it at Quan Hy one night. But what the menu described it as and what it actually was are entirely different. Quan Hy's Xoi Ga ($9.50) is far and away better than the words on the menu make it out to be. Contrary to the description, the chicken isn't so much "shredded" as it is compressed and fried--fried to be one of the most delectable pieces of poultry I've had in recent memory. To look at it is to marvel its inception. In its uniform flatness is a shape as sleek as an iPhone. An entire, intact chicken thigh is squeezed into this compact frame like a contortionist. The flavor is concentrated through and through, an aromatic marinade that tastes as familiar as what is used in traditional Vietnamese fried chicken called ga chien. What's more, the meat is well-cooked, crisped to dark brown on the edges exposed to oil, moist everywhere else. The rendered skin crackles, slit like gills at strategic locations on the patty so that it stays attached during cooking. Equal to the wondrous discovery of the chicken is the reinterpretation of the sweet rice. Formed into rectangular spears and also deep-fried, the eyes expect either a tater tot and a French toast stick. However, the mouth experiences something even better: it has an oily, Rice Krispy-like crunch leading to a soft, rice-pudding-like center, an ooey-gooey substance that absorbs the sweetened soy dipping sauce like a sponge. The lesson from all this? Like all Little Saigon's restaurants, Quan Hy's menu descriptions undersell what it actually offers. 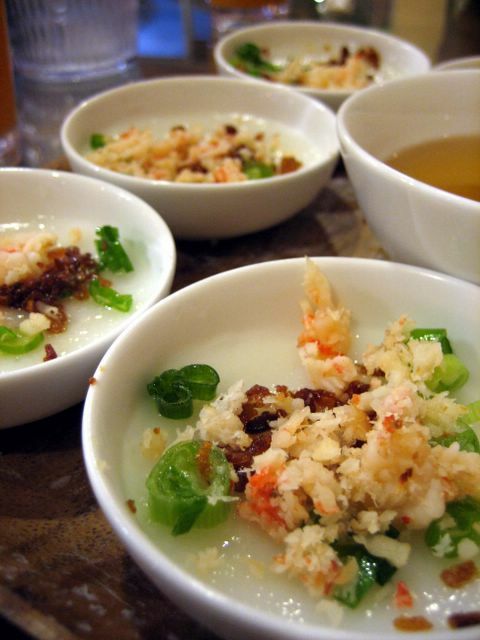 After all, does "steamed rice-cakes with shredded shrimp" even begin to represent the miracle of their banh beo, their most popular Hue dish? 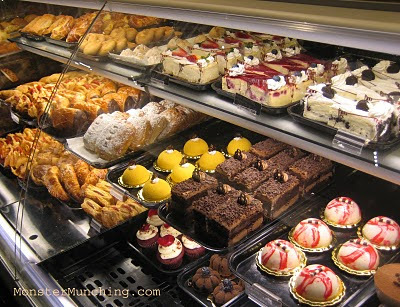 Area bakeries, patisseries: the disturbance you feel in the Force can be explained. Porto's has opened in Downey. It's only the third Porto's in the Southern California area, but it's one that people like me have been waiting for. 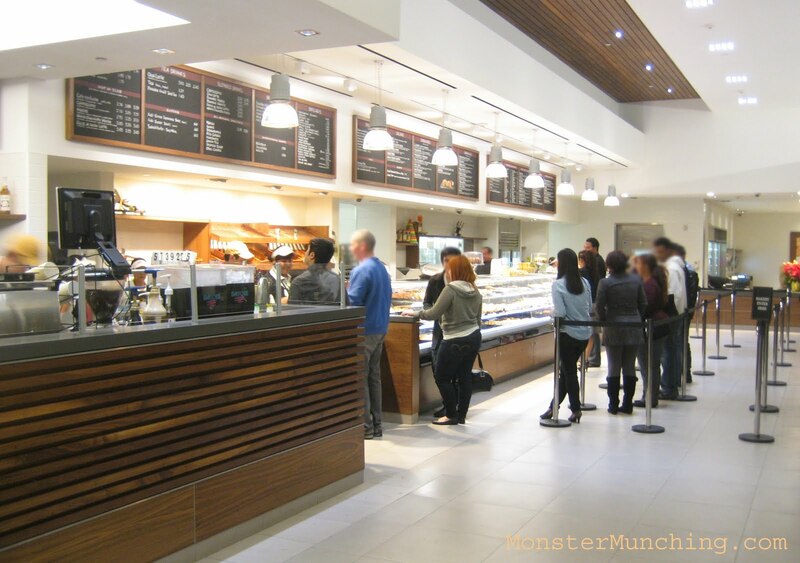 It is perhaps the most anticipated bakery to debut anywhere in our vicinity and it is massive. This is a bakery of a different order. A bakery with its own gravitational pull. It easily dwarfs the one in Glendale, and is even bigger than the one in Burbank. The building it occupies used to be bank, a Cal Fed. Sight lines disappear into the horizon. Customers standing in its two queues ebb and flow like the surf. High tide is all the time, until the doors slide shut at 8 p.m. Around 8:01 p.m. there are bound to be stragglers who beg, plead, to get inside. Everyone has their own reason to love this Cuban bakery. I have more than a few. First and foremost: their potato balls, orbs of mashed potato stuffed to the edges with seasoned, spicy ground beef, fried to golden-brown with a fine-grit breadcrumb crust. The thing weighs as heavy in the hand as a shotput, but on the palate, it's light and blubbery, gone in an instant. Croquettes are kind of like the potato balls but forgo the spuds for shredded chicken-meat enconsed in a creamy mixture. They are formed into little footballs before being deep fried to craggle-crusted awesomeness. Then there's the cheese rolls, a wonder rhombus of flakiness, the cheese danish of the Gods. 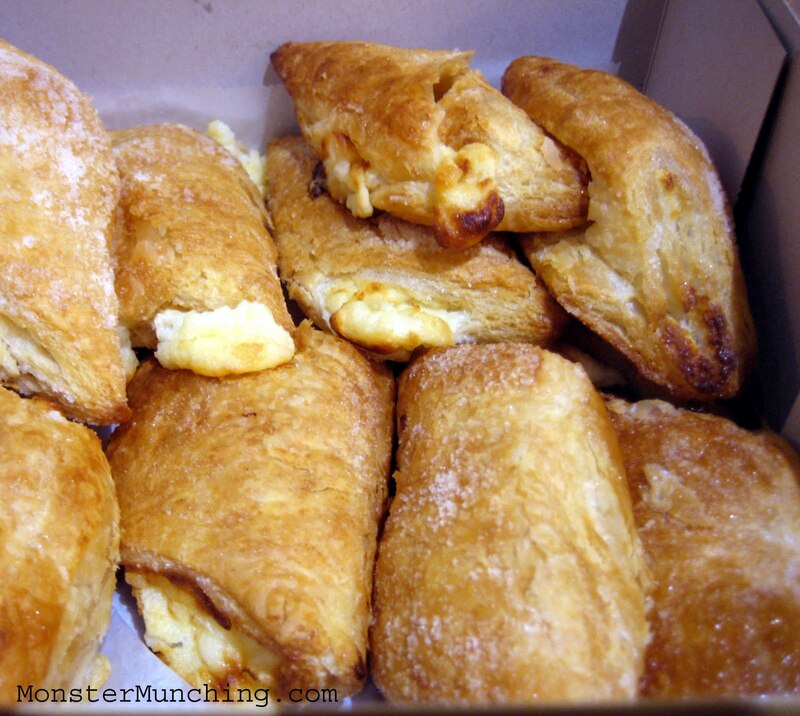 Other bakeries make it, but none can do it like Porto's. We bought a dozen and ate a few while it was still warm. The sugar dusting on the top crackled 'neath our teeth, the layers of crispness parting in shards, and the salty/sweet/savory cheese inside, the soft landing we needed. Our eyes rolled back into our heads. Baked goods don't get more orgasmic than this. Sandwiches range from the traditionally Cuban, to some that are sort of Italian, all with crispy plantains as long as tongue depressors subbing for chips. The empanadas are fine and tasty, so are the husk-wrapped tamales, which can be a bit dry. But there are literally hundreds of other delights to try; other discoveries to be made. 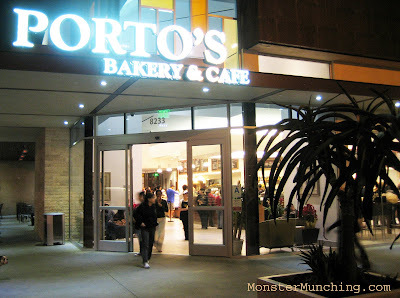 Porto's has opened in Downey. And it is good. There are only a few items your humble scribe craves when the weather gets this frigid. The Korean soft tofu soup called sundubu jjigae is high on the list, as is anise-scented bowls of pho. But generally, hypothermia usually sends my brain dreaming of any noodle soup, its country of origin not as important than that it is scalding hot and contains lots of things for my chopsticks to pluck out from the broth. Our most recent bowl fulfilled all the requirements, and found in an unlikely place: a banh mi shop. Zon Baguette's has been plying soup and rice for a while on a separate menu list in addition to its sandwiches, but I've never taken them up on it until now. And the soup I asked for isn't even on that list. We saw it scribbled on a white board, and things written in non-permanent marker is what I tend to gravitate to. This is a standard, honest, good mi dac biet, crinkly thin egg noodles with protein odds and ends from tender crimson-rimmed BBQ pork, barely-cooked shrimp, and pieces of breast meat chicken that would've otherwise been stuffed into a sandwich. The soup is clean, uncomplicated, the essence of chicken, maybe pork, enlivened by a squeeze of lime, and exactly what I needed. She opted for her usual sandwich, but the sight of me slurping noodles and noisily sipping my soup proved irresistible. We ended up sharing both the sandwich and the soup, alternating between them, passing the bowl and the sandwich back and forth, our cheeks becoming warmer and rosier after each successive gulp of broth.